I’m a huge fan of audiobooks and have been since the days of cassettes. Audiobooks are great for travel, especially over repetitious routes. I spent last weekend in the bay area to attend some Tibetan teachings, and I’ll be making more trips in the weeks ahead, so I wanted to find something to listen to on the road. I usually favor action-adventure novels for travel, but this time I chose A World Undone: The Story of the Great War, 1914-1918, by G.J. Meyer. The opening was so fascinating – history truly can be more fantastic than fiction – that I downloaded the ebook in order to read certain sections in detail. But why choose such a tragic story for a road trip? For several reasons. Mostly because the Great War has held a haunting fascination for me since I read All Quiet on the Western Front when I was sixteen (the author, G.J. Meyer said something similar in his introduction). Because of my father’s work, we were living in France when I read the book, and older people at that time remembered the war. Several told us there wasn’t a family in France that didn’t lose a father, or husband, or brother, or son. I remember sitting in old cafes and parks, thinking that everything must have looked the same to the young men in 1914 who would march into a maelstrom no could have imagined, least of all their leaders. Like the Titanic two years earlier, the first world war was a tragedy we cannot forget because it marked a loss of innocence for the generation it consumed and for every one that came after. As the title of Meyer’s book suggests, a world order was swept away in a horror no one wanted. An assassination should not have sparked a world war. In that era, assassinations were commonplace. In the years before 1914, presidents of the United States, France, Mexico, Guatemala, and Uruguay were killed, as were Prime Ministers of Russia, Spain, Greece, Bulgaria, Persia, and Egypt. Kings and Queens of Austria, Italy, Serbia, Portugal, and Greece were murdered, and no armies were mustered. This time things spun out of control through a series of errors and misunderstandings that makes one cringe when seen through the lens of history. Meyer describes in detail these “decent, well-intended men,” leaders of backward-looking monarchies and empires that were already out of date. Kaiser Wilhelm owned 300 military uniforms but failed to understand how little glory there was in facing machine guns and poison gas. Franz Joseph, Emperor of Austria-Hungary, didn’t even like his nephew, the Archduke who was assassinated, but he let his generals persuade him that punishing Serbia might restore some of his nation’s fading glory. What does one do in such a situation? There aren’t any clear answers, but a few thoughts came to mind as I mulled this stuff over during my trip. It helps to think that most of our leaders are clueless instead of the villains I sometimes take them to be. The thought reminds me that it’s as much a waste of time to indulge in anger as it is to believe they have any real solutions. Our current politics and economics are mostly driven by fear. During the run-up to World War I, the Austrian ambassador said, “Fear is a bad counselor.” His words are as true today as they were a hundred years ago. Making decisions based on fear is something I try to avoid, though clearly it’s sometimes difficult. Avoiding most TV news programs is a good place to start. 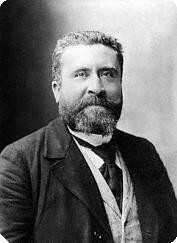 In Meyer’s opinion, Jaures was the one man in Europe who might have been able to calm the war fever that gripped all of Europe at the end of July. On the afternoon of July 31, 1914, a confused and unemployed 29 year old named Raoul Villain was walking through Montmartre with a gun in his pocket. He was planning to travel to Germany to assassinate the Kaiser, when he saw Jaures and some friends enter a nearby cafe. Ever careless of his own safety, Jaures sat with his back to an open window. Forgetting the Kaiser, Villain fired two bullets into his head. War was declared the next day. Jaures reminds me of Gandhi and Martin Luther King, two other men whose lives and deaths ask us what kind of world we want to live in. One way or another, our actions answer that question every day. I know what kind of response I want to give. This entry was posted in Authors, Books, History and tagged Audiobooks, authors, books, history, politics, World War I. Bookmark the permalink. Wonderful post, Morgan. Thanks for an absolute feast for thought. Thanks,Rosi. I appreciate your comment since I broke several of my own blogging rules of thumbs, but sometimes a piece will demand to go in it’s own direction.